The property was ok, nothing special and nothing to dislike. Great Staff... Excellent value.... Location Fair, a bit hard to find. 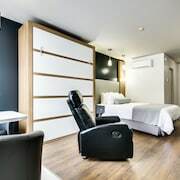 Where to find Shawinigan hotels near an airport? 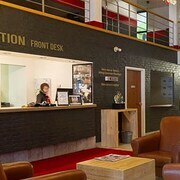 Where can I find hotels in Shawinigan that are near tourist attractions? 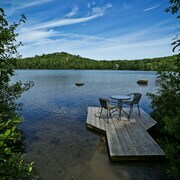 Shawinigan features 12 Expedia-listed lodging options. Around 12 apartments and hotels are located within a 0.1-kilometre (0.06-mile) radius of Shawinigan's town center. The Auberge Gouverneur Shawinigan is a much-loved accommodation choice due to the fact that it is so close to Shawinigan's center. 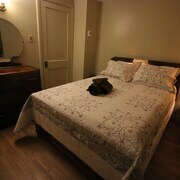 Expedia's accommodation database has just a handful of economical lodgings in Shawinigan. The Auberge La Rocaille is one such offering. 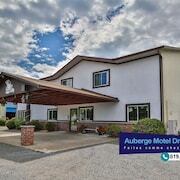 You could try the Auberge Godefroy and also the Delta Hotels by Marriott Trois Rivieres Conference Centre. The Auberge Godefroy is 30 kilometres (19 miles) away from the center of Shawinigan. The Delta Hotels by Marriott Trois Rivieres Conference Centre, is positioned 25 kilometres (17 miles) away. The Auberge Le Florès and also the Hôtels Gouverneur Trois-Rivières are some alternative hotel options in Shawinigan. After you've enjoyed Shawinigan, you should leave time soak up the wider region of the Mauricie area. Spend time at Mauricie's old towns and churches. Outdoorsy types should also take the time to enjoy its forests, rivers and streams. In this region of Canada travelers can also enjoy cross-country skiing. 25 kilometres (17 miles) to the southeast of Shawinigan you'll find Old Trois-Rivieres, where you can find Galerie d'art du Parc and Ursulines Museum. 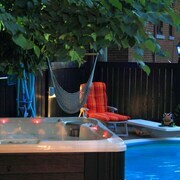 The Hotel L'Urbania and Hotel les Suites de Laviolette are some of the Expedia-recommended hotel options in Old Trois-Rivieres. Alternatively, you could consider staying at Becancour, 30 kilometres (20 miles) to the southeast of Shawinigan, where you can pick from the Manoir Becancourt and Hebert Hotel. Should you choose to stay in Becancour, a couple of sights worth adding to your itinerary are the Godefroy Golf Club and Quebec Biodiversity Center. Before you say goodbye to Trois-Rivieres, why not make sure you catch some sport. Visit Hippodrome Trois-Rivieres to the southeast of Shawinigan. Book a hotel close to the action at the Super 8 Trois-Rivieres or the Comfort Inn Trois-Rivières. Jean Lesage International Airport is a nearby airport, and is located 110 kilometres (67 miles) away from Shawinigan. 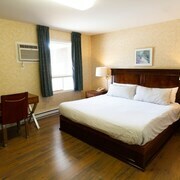 Conveniently located hotels include Grand Times Hotel Quebec City Airport and Comfort Inn Airport East- Ancienne Lorette. 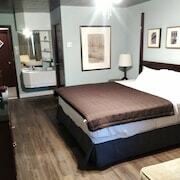 What are the most popular Shawinigan hotels? Are there hotels in other cities near Shawinigan? What other types of accommodations are available in Shawinigan? Explore Shawinigan with Expedia.ca’s Travel Guides to find the best flights, cars, holiday packages and more!